A Presbyterian congregation was meeting here in the late 17th century. Their chapel was destroyed by a Jacobite mob in 1715. A new chapel was built on the present site in the following year. The congregation became heterodox in the late 18th century, but reverted to orthodoxy in the 19th century. In 1818 the chapel was described a being "built with brick, quoined with freestones, and covered with Madely tiles. Close by it their teacher has a convenient mansion, not long since erected." In 1851 the chapel was reported to have 250 free sittings; there were 140 worshippers at their morning ervice and 170 at their evening one. They celebrated their 150th anniversary in 1866. When their minister the Revd George Smith died in April 1874 the chapel closed and the congregation joined with the Independents in Chapel Street, q.v. 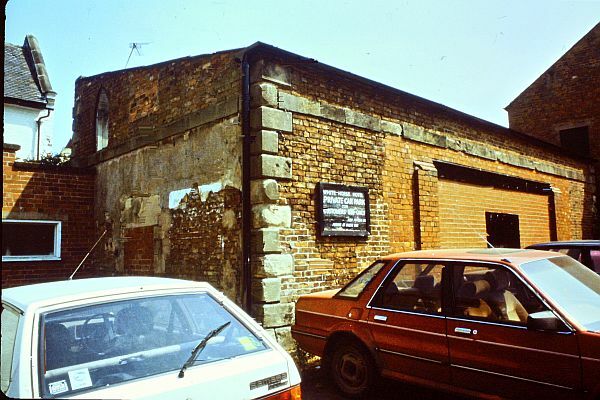 The chapel, located in the car park at the back of the White Horse public house in the High Street in a passage leading to Noble Street, has been substantially altered in modern times, with the lowering of the roof and the blocking of windows for its use as a garage. It is now virtually unrecognisable as a former chapel.